Enjoy a free, family friendly and interactive experience with the 16th president’s first lady and their family during a turbulent time of history. 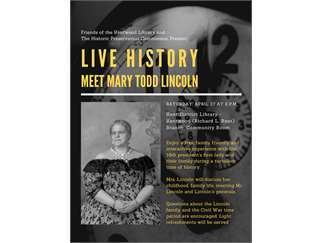 Mrs. Lincoln will discuss her childhood, family life, meeting Mr. Lincoln and Lincoln's generals. Questions about the Lincoln family and the Civil War time period are encouraged. Light refreshments will be served. When: Saturday, April 27 at 2 p.m.